The mains water supply in Cardiff is provided by Dŵr Cymru (Welsh Water), who provide water and wastewater services to over three million people in Wales. Dŵr Cymru (Welsh Water) is a sponsoring and supporting member of WRAS, the Water Board Regulatory and Advisory Service. 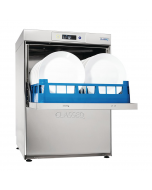 The water in Cardiff is rated as having some of the highest calcium carbonate composition (hard water) and a use of a water softener is strongly recommended to preserve the life of your glass washer or commercial dishwasher.